Seen at the local Fry's. It's a Dance pad/Software combo for the PC. 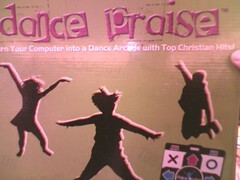 "Dance Praise: Turn Your Computer Into a Dance Arcade with Top Christian Hits!" Some might say "targeting a substantial niche"; but *I* say strategically timed product given that the Godfather of Soul just passed away! Or better yet a twister game/pad that that electronically transfers the info back to console/pc for playback and the likes? More interactive with more players engaged. Praise dance is a sort of move development now and again consolidated into sacraments or love benefits as a declaration of love. Some ceremonial move had been regular in antiquated occasions or non-western settings, with points of reference in the Hebrew religion back to records of moving in the Old Testament.